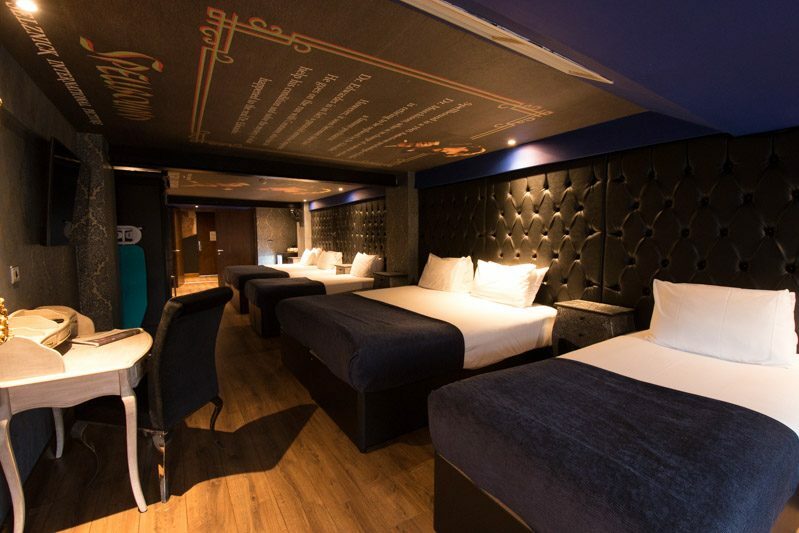 Be enchanted by our Spellbound inspired room and come on a journey to discover your psyche. 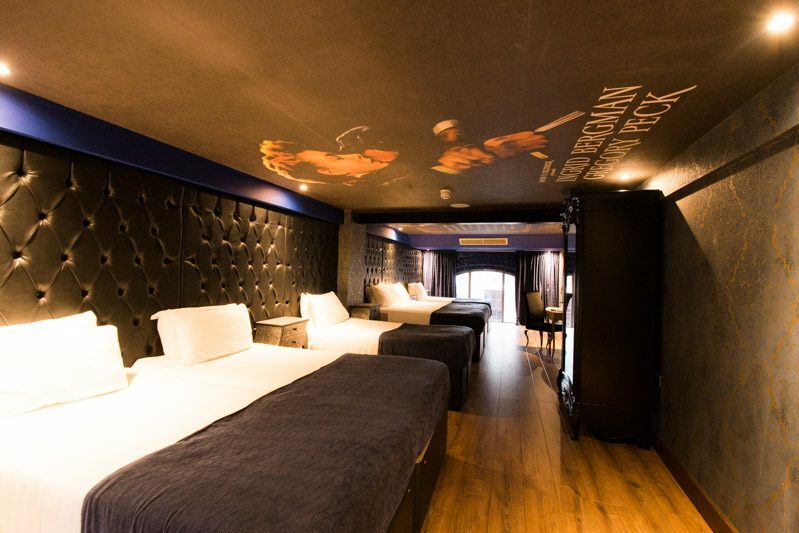 Just a few minutes walk from Liverpool’s thriving nightlife, restaurants and shops, our Spellbound room is perfect for your stay in Liverpool. 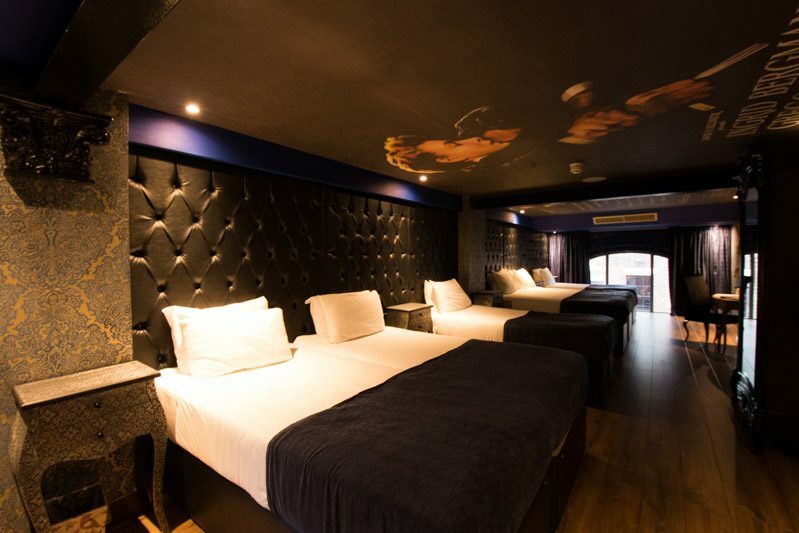 Expect all the luxurious facilities and features of a glamorous bygone era of cinema, relax in a stylish, comfortable room in the unique Arthouse Hotel. Sleeping up to six people, invite all your Hitchcock aficionados to stay in the luxury Spellbound room. 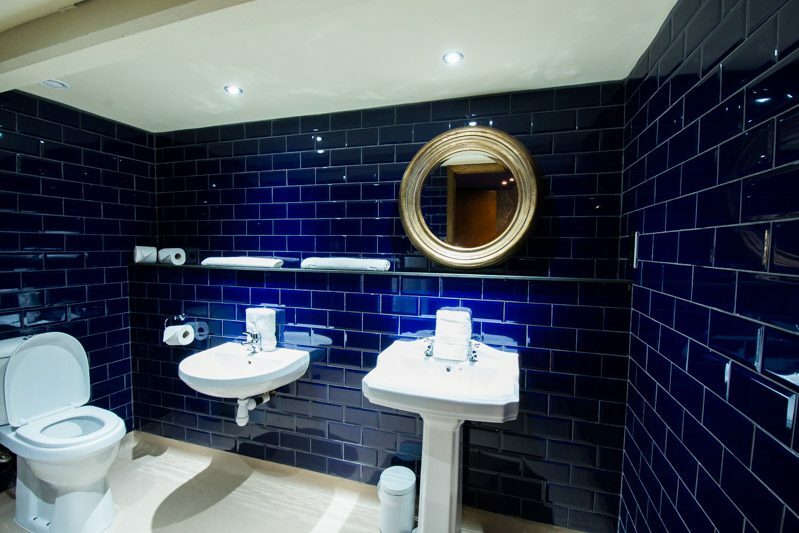 Enjoy the luxury beds, flat screen TVs and magnificent ensuite for a truly unforgettable stay. Spellbound marked Alfred Hitchcock’s 35th endeavour on the silver screen, the predominantly black and white film invites us to Green Manors, a mental hospital in Vermont. Here, we meet Dr Constance Peterson, a cold and emotionless female psychoanalyst, and learn that the current director of the hospital, Dr Murchison, is being forced into retirement after taking a leave of absence for nervous exhaustion. His replacement comes in the form of Dr Anthony Edwardes, a very young and attractive man. The film is based on a French novel, The House of Dr. Edwardes, written and published in 1927 by John Palmer and Hilary Saint George Saunders (under the pseudonym Francis Beeding), the book follows much of the same plot as the film with Dr Constance Sedgwick as the newcomer to the asylum. The book has a distinct gothic novel feel, being described by critics as a compelling piece of work that is part mystery and part modern gothic. It was director Alfred Hitchcock’s idea to transform The House of Dr Edwardes into a feature length film. At the time, Hitchcock was signed up to a contract with producer David O. Selznick, the same man responsible for Rebecca (1940) and The Paradine Case (1947), and wanted the rights to the thriller novel, Selznick agreed and acquired the book for $40,000. Spellbound delves into the world of psychoanalysis, a technique of bringing unconscious memories and thoughts to the surface as a therapeutic technique and treatment for some mental health issues. The term was established by Sigmund Freud in the 1890s and was a therapy used by producer Selznick, he even brought his own psychotherapist onto the set at a technical advisor, although she was largely ignored by Hitchcock. One of the film’s most notable facts of interest is famed surrealist artist Salvador Dali’s conception of the film’s key dream sequence. Hitchcock gave Dali free rein of the sequence, with only minimal plot pointers and the sequence ended up being 20 minutes long, Selznick cut it down to just two minutes. Starring Ingrid Bergman as Dr Petersen and Gregory Peck as Dr Edwardes, the film’s release broke every record for admissions in both of London’s top theatres: Pavilion and Tivoli Strand and earning upwards of $4 million in North America alone. The film received six Oscar nominations, winning one for Best Original Score for Miklos Rozsa, as well as getting Hitchcock a nomination for the Grand International Award at Venice Film Festival in 1946. While Spellbound is not one of Hitchcock’s most notorious films, it takes a popular place in the hearts of film aficionados as an underground classic. Spellbound is dark, mysterious and artistic, a true icon in the Hitchcock collection. Alfred Hitchcock was famed as ‘The Master of Suspense’, a title he earned over his 60-year career for his work as a pioneer of the progression of the thriller genre. Creating fear and unease with his unique filming style, an aspect that is ever present in Spellbound. Revered as the most influential directors of all time, Hitchcock will forever be remembered as an icon in film history. While mainly filmed in black and white, during the scene were Dr Murchison takes his own life, as the camera looks down the barrel of the gun from the doctor’s perspective a burst of red tint implies what has happened. Hitchcock’s thorough attention to detail meant the scene took a week a to prepare and 19 takes before he was satisfied. Spellbound was a source of major contention between Hitchcock and producer David O. Selznick, having experienced the treatment himself, Selznick wanted heavy influence in the film. As a perfectionist and meticulous artist, Hitchcock was not impressed with Selznick’s input and Spellbound was the last film that the two worked on together.